« Oh…and I make photographs. Life is cluttered and noisy. This isn’t bad, it’s just how it is. Life is noisy, generally. The TV is on, someone is buzzing the phone, cars are endlessly passing by, we are talking to someone, someone is talking to us, whatever is around us is breaking the silence. I usually roll down the windows and turn off the music as I drive on the back roads, the glorious two lane black top that takes me away from the interstate. I am seeking the stillness, inviting it in. 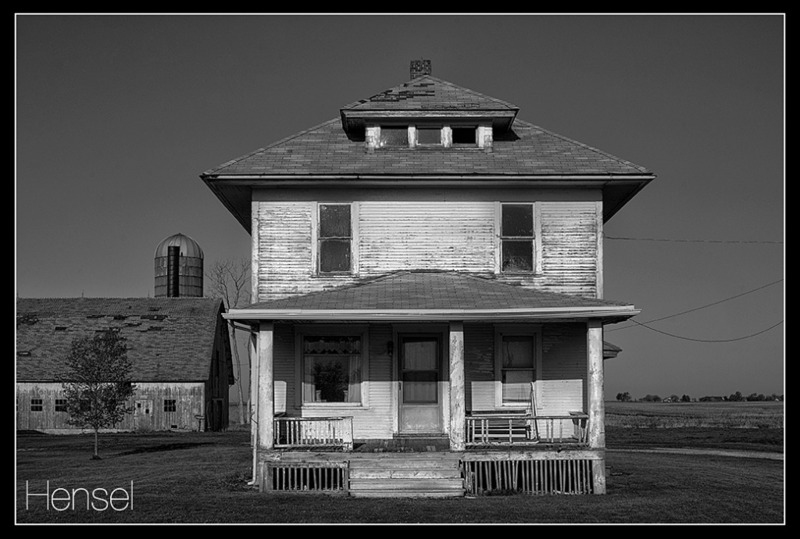 The abandoned houses are easy to spot, no cars in the driveways, no farm machinery in the fields, no wash on the line. I pull the car over and shut it down. I am out of the car and standing on the side of the road assessing the scene, aware of the silence. I am many miles from any town. The empty horizon dotted with structures fades away in every direction. There is no traffic, no active machinery, everything around me comes together and the sensation is palpable. Stillness. In the midst of busy noisy America, I am alone and still. Love your work, and again, you should really check out the work of Wright Morris, Walker Evans and Edward Weston, you will love it.